Ideally, tables are quickly and easily readable. Removing repetitive content helps the reader to grasp the essential result quicker and makes tables more readable. A possible option to make a table more readable is to replace repetitive content across a column with an arrow. 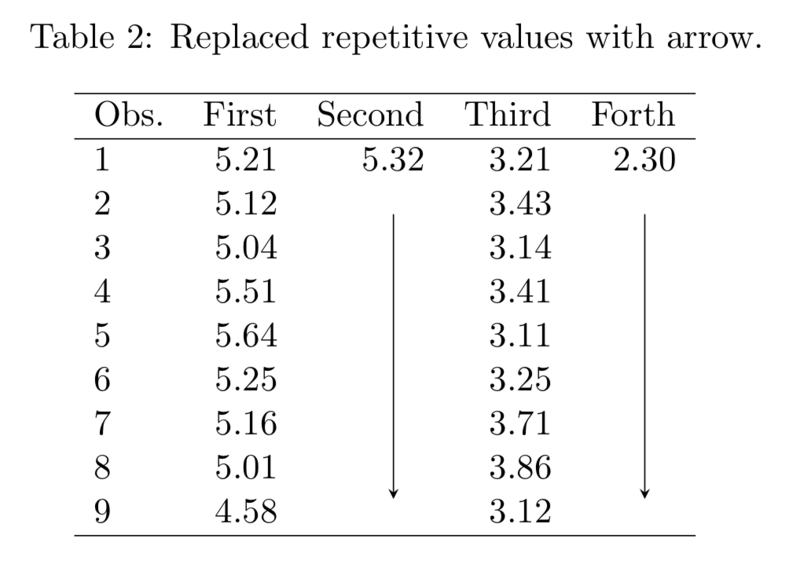 We will use TikZ to draw an arrow from the second to the last row of the column, replacing repetitive content. For that purpose, we require two macros, the first stores a location in a cell and the second links two locations with an arrow. The first macro creates a node in a table cell. The first parameter is the name of the node, so that we can later connect it with an arrow. The second parameter is the value of the cell. We use \phantom to occupy the right amount of space without showing the value to make sure the arrow will be horizontally centered. The second macro links two nodes with an arrow. We call this macro outside the tabular environment. Now, we use the two macros to replace repetitive content by an arrow. For that purpose, we add a \tikzmark to the first and last cell to be replaced. At the end of the table, we then \link the two cells by an arrow. The relevant lines are highlighted in the code below. The idea of using macros based on TikZ was taken from here. Do you also know a good way if you have in a row repetitive values over several columns? You could draw the arrow horizontally instead of vertically.